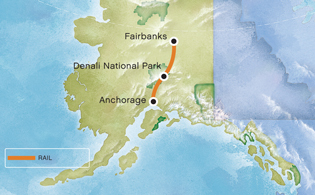 Anchorage and Fairbanks accommodations and travel to and from the Anchorage and Fairbanks railroad depot are not included. Enjoy an incomparable sightseeing experience aboard luxurious domed railcars. Take in the wide-open scenery as you travel through the Matanuska Valley, a farming region known for mammoth vegetables; past colorful towns like Wasilla, billed as the "Home of the Iditarod;" and along scenic rivers like the Susitna, which means "Mother River". By afternoon you arrive in Denali National Park. Spend the night at a spacious Denali-area lodge. Overnight Denali-area hotel.